Globe Telecom continues to set a world-standard in retail with the opening of its 4th GEN3 store in Greenbelt 4, Makati. 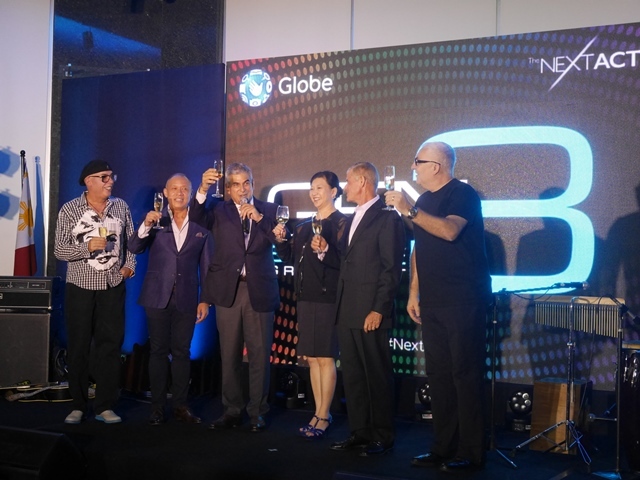 As the number 1 mobile brand in the country and leader in the digital space, Globe continues its major transformation efforts to give more customers an outstanding digital retail experience. Located at the central business district, home to the country's biggest offices, retail establishments and corporate headquarters, the previous average-sized store was converted into a two-storey version that showcases the major features of the new Globe GEN3 stores. From the reconfigurable major lifestyle zones such as Music, Entertainment, Life and Productivity to the self-service customer kiosks, more customers in Manila will now be able to experience next-generation retail in a dynamic and interactive space. Joining in the celebration are the telco's guests of honour made up of the Singtel Board of Directors led by Singtel Group CEO Chua Sock Koong, Singtel Chairman Simon Israel, and finally the Chairman of Globe and Ayala Corporation Jaime Augusto Zobel de Ayala. During the GEN3 store opening program, the representatives of the Singtel community also took the opportunity to reinforce their support to Globe and its corporate social responsibility programs. Singtel representatives formally turned over a 1 Million peso donation received by Mrs. Catherine T. Magcope, School Principal of Madalag Elementary School, who represented the rest of the school beneficiaries in Aklan. The donation is for the procurement of school fixtures, such as classroom armchairs, teachers' desks and the like. "Since the opening of our GEN3 Stores last year, this new store format has given us immense success especially with the positive response from our customers. With GEN3, we are able to interact with and provide better service to our customers. We ensure that we have maximized every corner of this new store to give everyone who walks in a chance to discover and learn something new every time," shares Globe Head of Stores and Retail Transformation Management, Joe Caliro. Performing a great mix of Disney hits, invited guests also enjoyed a special number from the country's top local artists such as Asia's Got Talent finalist, Gwyneth Dorado, The Voice Philippines' finalist, Kokoi Baldo, and online music talent search, Spotify Emerge finalist, Marion Aunor. Curating mobile and broadband technologies as connected and solutions, each lifestyle zone showcases interactive activities that customers can discover and experience. Whether a customer is in to music and entertainment, or productivity, there is a space that is sure to pique their interests. The Globe GEN3 stores are designed by Tim Kobe, founder and CEO of Eight, Inc. His most famous work is the Apple Store in New York, and international retail stores such as Nike, GAP and Coach, among others.